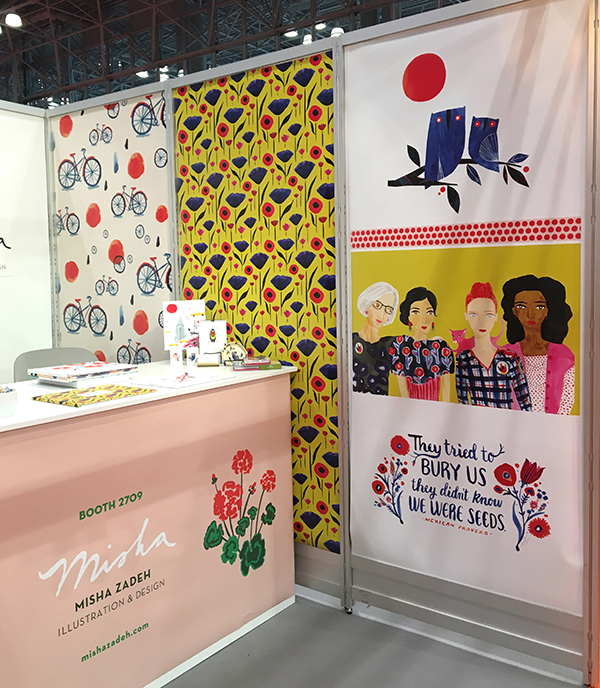 Misha Zadeh Illustration & Design's second time at Surtex was a charm! We knew what to expect and what we were looking for. 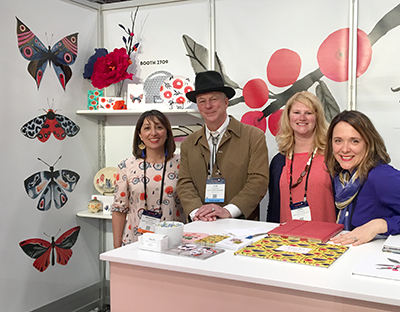 Surtex is the premiere art licensing trade show that runs concurrently with ICFF (The International Contemporary Furniture Fair) and NSS (The National Stationery Show) in May at the Javits Center in NYC. 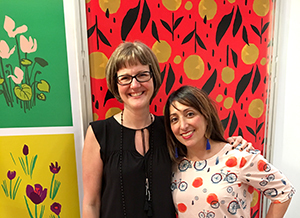 This year my booth team consisted of Surtex veteran, New York-based Mia Baudry and newbie Seattleite Karen Gustafson. 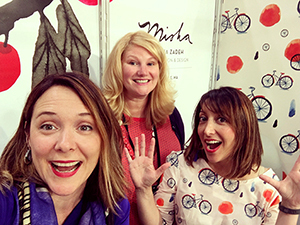 Their mix of skill sets and personalities was perfect, and as you can see, they complied with my requirement to model Misha patterns and/or color coordinate with the booth. We had way too much fun exhibiting together and by the end had nicknamed ourselves The Three MishKateers. Despite attendance being down for both exhibitors and attendees, we had some terrific visitors to our booth with projects we are dying to tell you about. Stay tuned! It was nice to see some of our established clients, and to meet potential clients on our wish list as well as those we weren't familiar with before. Location-wise, our booth was at the front of the first aisle, surrounded by agent booths, and just up from the escalator entrance to the show. I was nervous about switching locations from last year, which was right smack in the middle of the show and got great traffic, but I think we had better visibility up front. When creating my booth banners this year I had a sudden urge to use lots of red. I think that energy and Feng Shui helped hook people in. 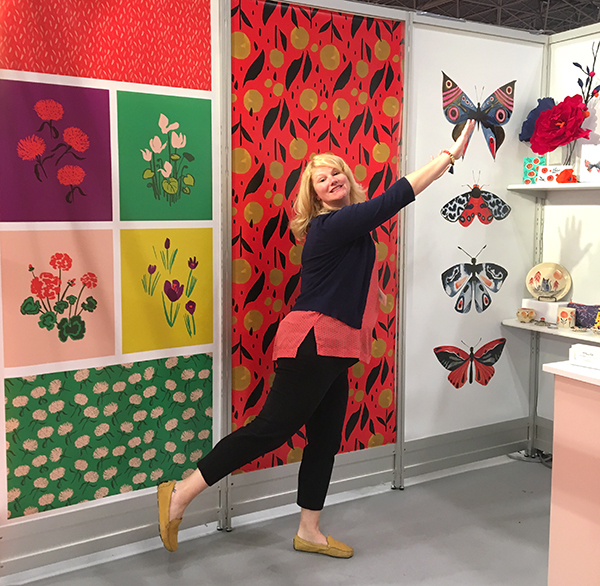 Because we were just one aisle away from ICFF, a lot of folks thought we were wallpaper designers and wanted to put in an order. Wallpaper companies, are you listening? 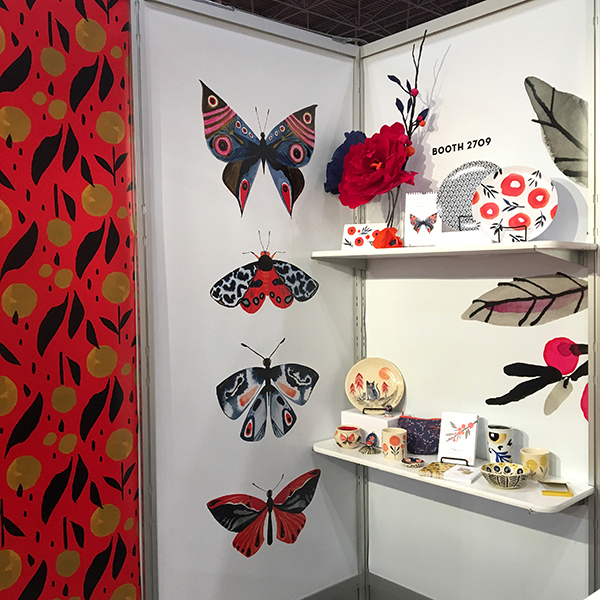 Speaking of booth decor, the ceramics and fabrics that I lugged across the country proved to be worth their weight and hassle, as many buyers appreciated seeing my designs already translated onto the objects they create. They were a hit. 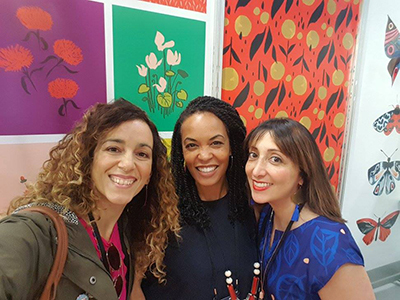 In addition to art directors and manufacturers, we were lucky to have Allison Sloan Polish and Tara Reed from Spoonflower stop by. 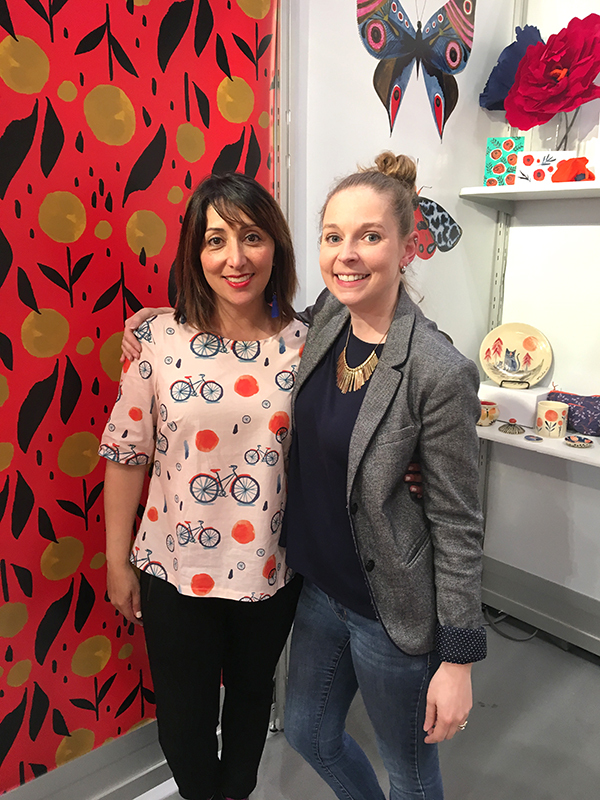 They gave great tips on boosting my Spoonflower shop presence, and I'm looking forward to uploading many new designs from my portfolio that they were swooning over. Bonus: they matched the booth and are such nice people. By the way, the top I'm wearing in the image above is the Lauren blouse in a cotton lawn fabric made with my Misty Bicycle print, available now through Spoonflower's affiliate Sprout Patterns.) 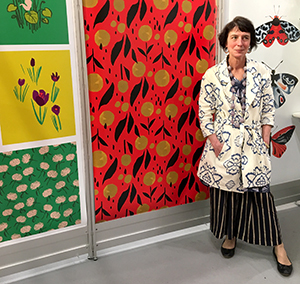 Also check out painter and textiles designer Sarah Charlton Frank, nestled up next to my Entomology panel and looking stylish in her ensemble. 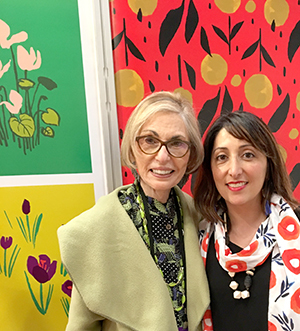 I got to cross off a bucket list item in meeting world renowned color expert and executive director of the Pantone Color Institute Leatrice Eiseman. She has such a presence, and of course her Pantone Color of the Year-inspired outfit was smashing. My crew got to meet, and be charmed by, Alan Friedman of Great Arrow Graphics. He gave us the latest updates about my new line for them which was literally on press during the show! Another fun surprise was a buyer from the neighboring Stationery Show, Daniel Goldin from Milwaukee-based Boswell Book Company. 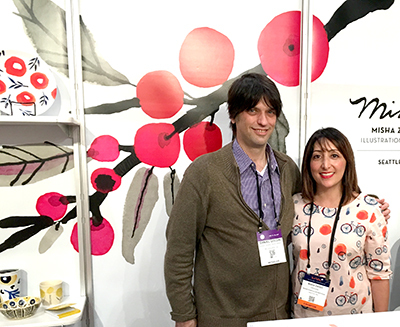 He heard I was showing at Surtex and made his way over to say hi and that he's been a fan and buyer of my Madison Park Greetings designs for years. Awwww. I taught him how to pronounce my last name (Zah-DAY) and he taught us that you don't pronounce the 'l' in Milwaukee. In six degrees of separation news, I saw long lost colleagues from my Stationery Show days, a couple of fellow UW graduates, a buyer who also happened to be a UW graduate and who worked with a college friend of mine and is related to a high school friend of mine. 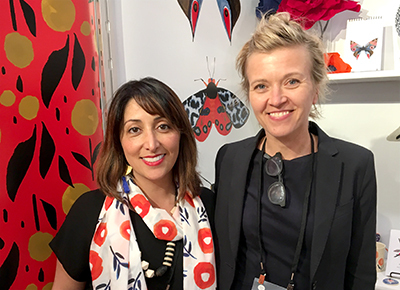 Of course I loved catching up with talented surface design friends and made many new ones. Basically three days of being super social and talking about art and application possibilities (which I love). Finally, perhaps you have read about my obsession with Ghormeh Sabzi, a delicious Persian stew made with a plethora of sautéed green herbs, red kidney beans, lime, and beef or lamb. Mia, Karen, and I were extremely honored, and humbled, to have been invited to the Brooklyn home of the lovely and talented illustrator, Kristen Balouch, for an evening of ghormeh sabzi and excellent company after the show on Monday night. 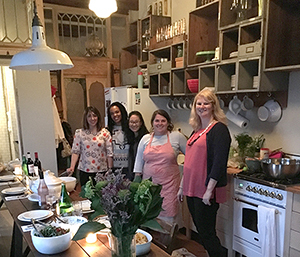 Here we are in her cleverly remodeled kitchen with artists Jeanetta Gonzales, Melissa Iwai, and Kristen herself in the pink apron. Side note: Kristen's Ghormeh Sabzi was AMAZING. Honestly one of the top three I've ever had. Kristen uses Najmieh Batmanglij's recipe. Coincidentally, Najmieh (the guru of Modern Iranian Cooking) was our featured guest at the 2016 Seattle Iranian Festival. 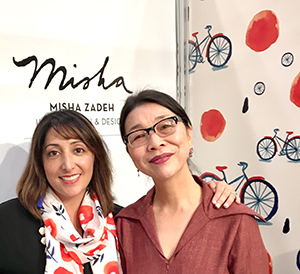 Six Degrees of Misha Zadeh. 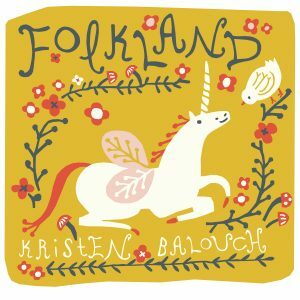 Check out Folkland, Kristen's debut fabric collection with Birch Fabrics, available in January of 2018. I am feeling blessed and lucky to have spent the week with such great people discussing so many exciting opportunities. Here's to getting those opportunities to market! 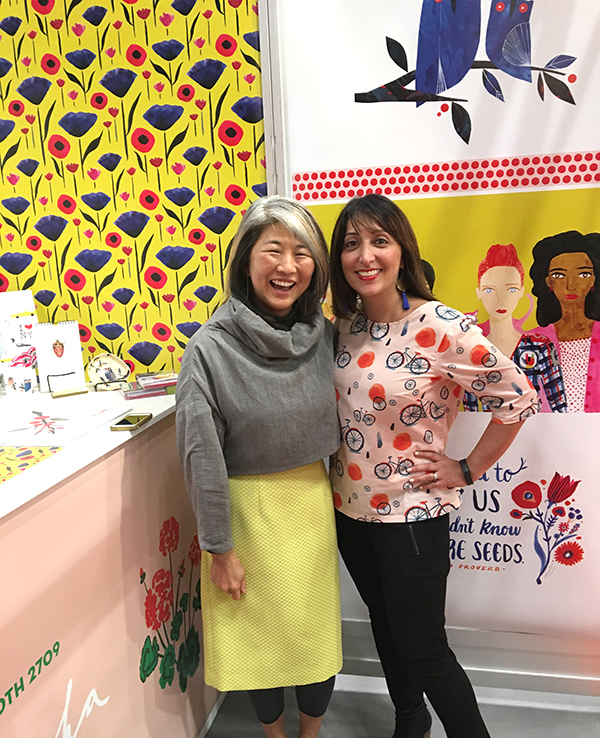 Were you at Surtex? Are you hoping to attend in the future? I'd love to hear your thoughts below.